Help Get Sponsors, the industry-leading sponsorship sales and management software, adds Multi-User Team Accounts feature to their robust offering. This upgrade enhances the existing software platform, which integrates unique start-to-finish sponsor prospecting, proposal, contracting, and activation management tools. The sponsorship sales software was created to overcome the challenges events face when attempting traditional sponsorship sales and helps create broader and more in-depth partnership opportunities more quickly. With the addition of the new functionality, organizations can give individual team members personalized accounts, allowing for better organization, visibility, collaboration, and tracking options, particularly important to large scale events and series. Each user on a team has a login that feeds into the master account, providing leadership a holistic view of the activity and pipeline of the entire team. This added feature not only allows for the same streamlined, customizable, real-time sales lifecycle tracking, but also allows each user access to all of the tools available to the master account. Multi-User Team Accounts are available at a flat rate for master accounts and a per license fee thereafter. Additionally, teams of 10 or more qualify for group discount options. Register now for a webinar, hosted by Tom Crichton, introducing new and prospective users to the Help Get Sponsors platform and Multi-User Team Accounts. About Help Get Sponsors Help Get Sponsors is a SaaS business, offering scalable sponsorship management tools, from an off-the-shelf, cloud-based CRM to fully customizable, white labeled platforms. The company utilizes its proprietary algorithm, available only at HelpGetSponsors.com, to aid event producers in managing sponsor prospects, accurately pricing sponsorships based on industry standards, and automating the creation of proposals, agreements, and activation calendars. For more information, visit www.HelpGetSponsors.com. The seasons are changing, but are your sponsorship sales strategies still the same? It's your lucky day! 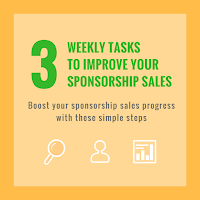 We will be giving a tour of the HelpGetSponsors platform to help you find ways to improve your current sponsorship sales. 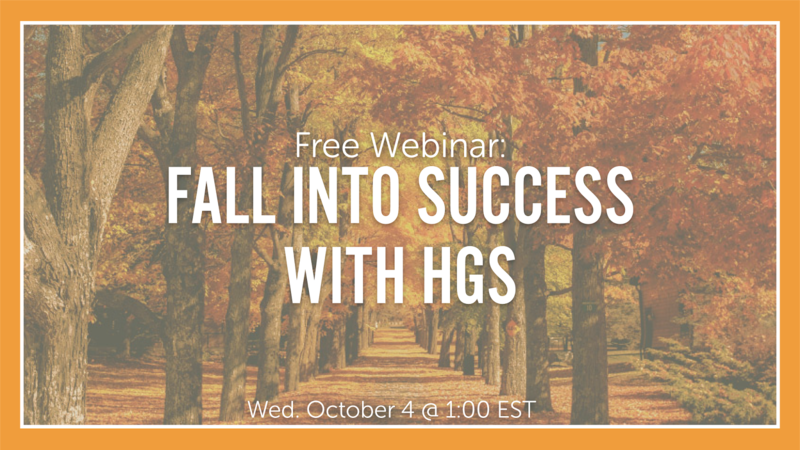 To make sure you don't fall behind on your sales goals this year, register for our free "Fall Into Success with HGS" webinar on this Wednesday, October 4th at 1:00 EST. You'll get a live demo of the HGS platform & learn practical ways to help you produce like an entire sales team. To attend our free "Fall into Success with HGS" webinar this Wednesday, October 4th at 1:00 pm EST, you can register here. Over the years, we’ve met with thousands of event directors who all want sponsors for their events. The reason they don’t have them? They recite a combination (or all) of the following excuses as to why they can’t secure, grow, and maintain sponsorships. Be honest, have you made any of these excuses? 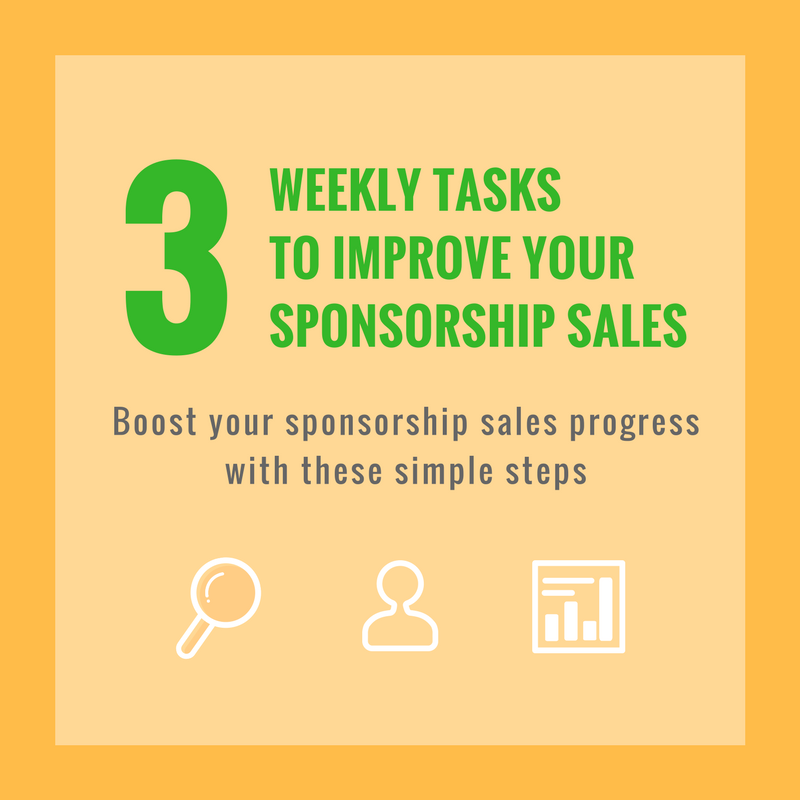 Read through the list and check out our suggestions on how to overcome them so you can begin selling sponsorships like a pro. We all know that there is a seemingly endless list of things that need done when preparing for an event, and time spent on sponsorships takes away from planning, ordering t-shirts, requesting permits, etc. But ask yourself; are participants going to become annual customers if you don’t provide a unique experience with promotions, vendors, food, and music? Do you have enough time and budget to facilitate all of the things your participants want and expect? Our guess is probably not. The good news is that sponsors can (and often want to) promote their brand by implementing some of those features, which actually saves you time and money. By securing strategic partners, you enhance the experience for participants, increase revenue for your event and charitable partners, and build a community among your sponsoring businesses and participants that will keep them coming back! 2. "I don't know how much my event is worth"
Determining the value of your event is an important yet tricky process. You don’t want to set prices too high so that businesses can’t afford to get involved, but also want to avoid pricing too low where your offerings are undervalued. A good place to start is evaluating how many individuals will be exposed to a sponsor’s brand by attending your event. This includes participants, spectators, event staff, and volunteers. Not sure how to calculate your event’s spectators? If you host an endurance race, estimate that each participant brings an average of one friend or family member to the event. Once you determine the number of participants and reach, you’ll have a baseline number to factor your sponsorship prices from. 3. "I don't know where to find sponsors"
Think about your participants and their interests. If they’re athletes, pursue your local sporting goods store, protein supplier, fitness club, etc. Next, consider what services your participants would like to engage with on-site. Cyclists would appreciate bike tune-ups and post race massages. Festivals that are kid-friendly can offer activities including face painting and balloon art. Everyone loves documenting their experience, so hiring a photographer is key. This allows photos of your event to be shared with participants’ friends and social media, which further promotes your event (and dare we say a sponsor to whom you sold photo branding). Finally, keep in mind that your participants are the target market for businesses in your area. Auto dealerships, hospitals, physical therapists, insurance agencies, etc. are all viable candidates for sponsorship. 4. 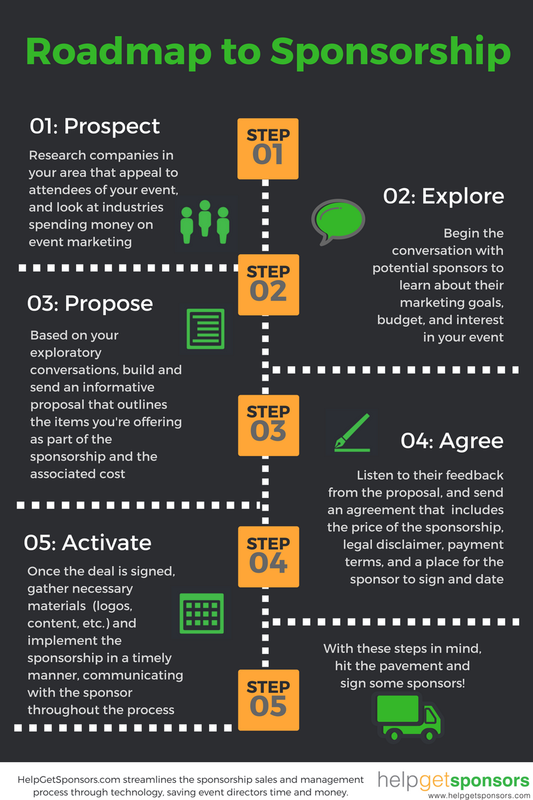 "I don't know what information to put into proposals or how to write them"
Drafting a sponsorship proposal can seem like a daunting task, but it doesn’t have to be! 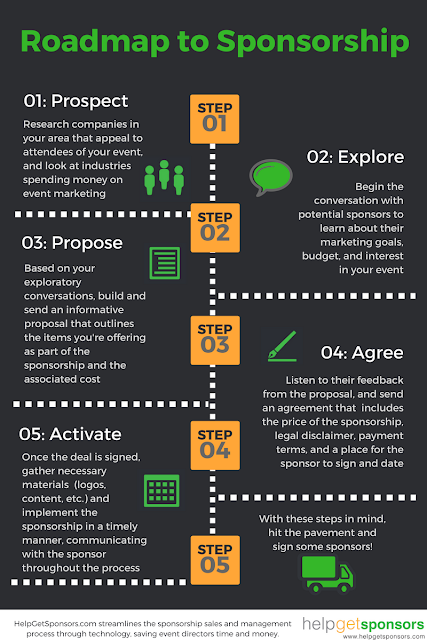 The purpose of a proposal is to educate sponsors on why and how they will benefit from supporting your event. Start by giving them an overview that includes where and when it takes place, who participates, and what activities are scheduled. Be sure to include information about any charities that are affiliated, and how your event impacts the community from an economic impact standpoint. Finally, outline the potential sponsors’ opportunities for involvement. 5. "The sponsor won't hold up their end of the bargain"
The last thing you want to have happen is to sign a partner and have the implementation of their sponsorship fall through the cracks. We recommend creating mutual accountability between you and your event partners by setting an activation calendar that details the items you need to implement their sponsorship (logos, brand guidelines, quotes, etc.). The calendar should include each aspect of their sponsorship, the items you need to activate it, and a deadline by which you need them. Now that we’ve combated your go-to excuses, get out there and sell some sponsorships! Shameless plug - The HelpGetSponsors.com tools make selling and managing your event sponsorships easier than ever. Our industry-leading software will help you overcome each excuse listed above. From identifying industries to pursue for sponsorship and pricing your offerings based on industry standards, to drafting effective proposals and setting up task calendars, the software guides you through each step of the process. To experience how the software takes the guesswork out of sponsorship sales and management, sign up for a free 30 day trial here.